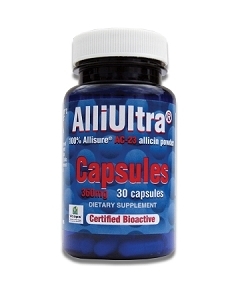 AlliUltra - 100% Allicin - Sample - 6 ct.
AlliUltra® AC-23 capsules contain 360 mg of stabilized Allisure® AC-23 allicin powder and is made from fresh raw garlic. Heads of garlic are specifically selected to ensure that they contain significant enzyme activity (allinase enzyme). Garlic heads are split into cloves, which are left unpeeled and then subjected to crushing, filtration and a temperature controlled extraction process designed to produce pure liquid allicin dissolved in water. No chemical solvents are used. The allicin amino acid in fresh garlic is subjected to complete conversion by the allinase enzyme and to ensure a large volume of active allicin is harvested. The volume of allicin produced is directly related to the enzymatic activity. AlliUltra®'s sophisticated refinement allows us to capture garlic's active component (Allicin) and deliver it directly to where your body needs it. Ingredients: AlliUltra® capsugel vegetarian size "1" capsules contain 360 mg Allisure® AC-23 concentrated natural allicin extracted from fresh garlic. Casing is Non-GMO maltodextrin. Free from artificial coloring, flavoring, salt, gluten and preservatives. Suitable for vegans and vegetarians. Formulation: Size "1" vegetarian capsule containing maltodextrin, gum acacia and allicin. Dosage: Up to 8 capsules per day may be taken if needed, and just one capsule a day of AlliUltra with food can be beneficial for health and well-being. It is easily absorbed.